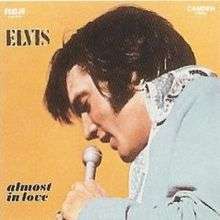 Almost in Love is the 39th album by Elvis Presley, released in November 1970 on budget label RCA Camden. It was the first of several albums on the RCA Camden subsidiary (others including C'Mon Everybody and I Got Lucky) to make available in LP format tracks that had previously been available only on 45 rpm singles or EPs. Tracks of note include 1968's "A Little Less Conversation" from the soundtrack of Live a Little, Love a Little (a re-recording of this song by Elvis for his 1968 TV Special would later be remixed by Tom Holkenborg aka Junkie XL and become a hit in 2002) and "Rubberneckin", a 1969 single from the film Change of Habit that had also been recorded in Memphis during the 1969 recording sessions. The song would later be remixed by Paul Oakenfold in 2003. The track "Stay Away, Joe" (the theme from Elvis's 1967 film of the same title) was included in error as it was already released earlier in 1970 on the compilation Let's Be Friends); when RCA reissued Almost in Love in 1973, it replaced it with a different song, "Stay Away", from the same film, which had never previously been available on an album. The title track of the album is a song from Presley's 1968 film, Live a Little, Love a Little. The album was re-released by Pickwick Records with different cover art in 1975 and was issued on compact disc in 2006. It was certified Gold and Platinum on January 6, 2004 by the Recording Industry Association of America. ↑ Graff, Gary; Durchholz, Daniel (eds) (1999). MusicHound Rock: The Essential Album Guide. Farmington Hills, MI: Visible Ink Press. p. 892. ISBN 1-57859-061-2. ↑ "Searchable database". RIAA. Recording Industry Association of America. 2013. Retrieved May 26, 2013. Note: Enter search for "Almost in Love"